Lyadov was born in 1855 and taught in the St. Petersburg Conservatory, as well as being a conductor and composer. He was very interested in folklore. Most of his works are on a small scale. He taught at the Moscow Conservatory where his numerous pupils included Nikolai Myaskovsky, Sergei Prokofiev, Boris Asafiev, Maria Gnessina and Viktor Belyayev. He had a great empathy for fairy tales and poetry. Some of his works resemble those of Glinka and Rimsky-Korsakov - especially the latter. Two dominant themes are reflected in this rather short-playing collection. The folk aspect can be heard in the Eight Russian Folk Songs op. 58. The fantastic vein of Russian folk myths, reflected in Arthur Ransome's Old Peter's Russian Tales, can be heard in the brilliant miniatures that are to be found on the first five tracks here. Baba Yaga, Enchanted Lake and Kikimora embody supernatural entities and tales. A visionary voice comes to the fore in From the Apocalypse and About Olden Times. Svetlanov lights up all these works. From the Apocalypse positively seethes, shouts and glows. The blaring Old Testament brass (3:03) adds immeasurably to the Mussorgskian grandeur. About Olden Times has a bardic potency redolent of Borodin and Kalinnikov. The harp and reedy strings lend the lovely thematic invention a grainy pleasure. Baba Yaga, the witch, really leaps into life - groaning, cranky, steely, threatening and remorseless. The playing is immensely impressive - an elite orchestra in full cry. The Enchanted Lake takes us into the gleaming and glimmering Rimsky-Korsakov territory - those Edmund Dulac and Kay Nielsen Russian fable illustrations reach out off the printed page. Kikimora is another witch subject with plenty of tension, Borodin-style woodwind (1:10), sinister bass rumbling, Firebird fluttering and lurid grotesquerie. The Eight Russian Folk Songs are even briefer vignettes: playful, vital and poetically dreamy. Village Dance Song is a riot of pizzicato and balalaika evocation. The final Round Dance Song recalls Mussorgsky and Glinka (Ruslan and Ludmilla and A Life for the Tsar). The playing ripples with virtuoso energy. Get your aural sunglasses out for a dazzling sunburst of sound and fantasy. These interpretations are in the expert hands of Yevgeny Svetlanov and a young – well, mid-40s - Svetlanov at that. I had this disc and threw it away. I agree with your characterization of the performances, but to make absolutely no mention of the woolly, awful, typical 1970s Soviet sound is inexcusable. I rely heavily on MusicWeb International's reviews and am very disappointed in your lack of mention of the awful sound quality. You use the words 'blaring', 'reedy', and 'grainy' as compliments! They definitely are not. "Aural sunglasses" indeed! And, above all, no comparison with the old ASV disc! I am sorry that Bob feels let down by my review. This is a case of one person loving a particular sound while another hates it. Ever since hearing what were for me landmark Melodiya LPs in the 1970s (and later) I have gloried in the blaringly gaudy and dazzlingly lit sound - the sheer magnificent excess of the Melodiya 'signature' and the Soviet style of playing. 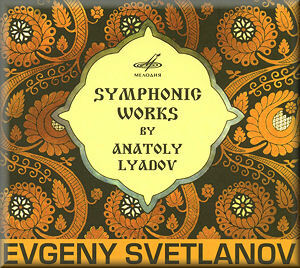 Amongst many I would single out for praise the Svetlanov Manfred, the Rozhdestvensky Enescu Symphony 1 (Moscow Radio SO), the (DG) Mravinsky Tchaikovsky Leningrad symphonies, the Rachmaninov Symphonic Dances from Kondrashin and any number of Golovanov recordings. Recently I found another to add to the list courtesy of the recommendation of Nicholas Barnard: Olympia OCD139 - Tchaikovsky 'Francesca' and 'Romeo' - USSRRSO/Vladimir Ovchinnikov. I rather lament the loss of all that passion, those liquid horns, those harsh trombones and blaring trumpets, those soulful clarinets and the deckle-edged violins. A new wave of international conformity has brought with it refinement but often a blandness of style that sits ill with some composers. I know that many regard this as a depraved taste but this sound, this vitality which strains at and bursts through the limits of analogue technology of the time is, to me, intensely atmospheric and exciting. It drew me in to classical music and holds me even now. I know that many will not share this perspective so I try to describe what I hear and leave it to those who regard this as condemnation to condemn while I enthuse over it. I did not have the now-deleted ASV disc to hand at the time of writing the review so can only compare with what I have available. Bob clearly loves the intensely imaginative music of Lyadov as much as me. I would have been interested to hear which version he favours: presumably the ASV? I also provided links to other MWI Liadov reviews.